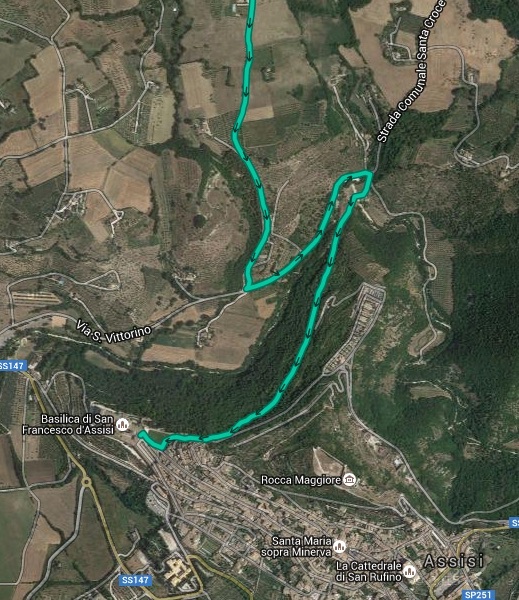 GPX Tracks for the Via di Francesco – Florence to Assisi to Rome. You will need to purchase the book and create a Cicerone Library to collect the GPX files. Go to the link toward the bottom of the page marked “Downloads.” Click. Once you’ve signed in or registered you’ll be returned to the GPX download page. Now you’re able to download the tracks. Cannot find the latest GPS file. Hi Georgette ~ Can you say more? Have you gone to the Cicerone site? I’ve downloaded the GPX-files from the Cicerone site, but it seems something went wrong with the second track. When I upload it in Viewranger it is called ‘Bridge closure detour track’ and it’s only a short track in Spoleto Can you maybe help me with the complete track? I gonna walk the full track in May, really looking forward to it, thank you for the nice guide and the updates, not to forget the accommodation list! Hi Maartje ~ The GPX files have several tracks included. It’s possible that ViewRanger doesn’t allow importing multiple tracks in a single file. You might want to consider using a different GPS app, such as Galileo Pro, which has no problem with multiple tracks.